It is a truth universally acknowledged, that a woman in posession of an income must be in want of a pretty frock. And shoes. and a handbag to match. Oooooh, and some earrings, they’re supposed to be the equivalent of a smart tie for a woman. We want, we want. Today, Maddie and I set out in search of a Consumer Cathedral in which to spend her £20 birthday money. She was like a dog with two tails, for she knew this was a rite of passage. In England in the 21st century, every young lady of substance learns to walk these halls, with their gleaming pale stone floors and cavernous heights, packed floor to ceiling with temptation fuelled by multi-million pound corporations. Slick and seductive, the very shop windows call like sirens. And at my side trotted the little Trainee Consumer, holding a perfectly formed handbag, thrilled at the prospect of a good purchase. I had allowed us about an hour, which is not long, when one considers her mother could pass three in this great hall without once looking at her watch. First we popped into a fashionable clothes shop, where she selected a pretty top and a set of jingly bangles. Then we went to the make-up shop. Now: I have to thank clever Auntie Nicky, Maddie’s Godmother, for a few master strokes in this area of my daughter’s life. Far too young for make-up, Maddie nevertheless desperately wants to wear it. She has spent ten years watching her mother’s Elizabeth Taylor-style love affair with mascara and jet-black kohl, and all she wants from her pre-going-out routine is to sit in front of a mirror, carefully applying potions and preparations calculated to beautify. Just before her birthday, Maddie’s fairy godmother appeared with a bell-like synchronicity. She took us to one of the greatest shopping cathedrals of all and packed me off for a blissful hour, while she and Maddie set off on a girlie quest for sparkly things. We met again at Krispy Creme, and had I not had sticky fingers and jam round my mouth I would have flung my arms around my good friend’s neck. She had equipped Maddie with transparent mascara, sweet unobtrusive lip gloss, the faintest pink sparkly eye shadow. All tasteful, all perfectly in keeping, all broadly transparent. We have continued in the same vein: today my daughter tested myriad products but felt the need to buy not a thing. We came away, Maddie thrilled, me relieved. Because it seems the little consumer has perfect control of her wishes. She is not avaricious: she likes these things, but does not need them. In this day and age, surrounded by the beautiful and the barely attainable, that’s quite an achievement. When I was a child, my father took me to an exhibition of local art. It was the usual, fairly standard collection of landscapes and portraits seen through the eyes of others, each a unique perspective, each a point of interest. Everyone has something to say, don’t they? Three quarters of the way round, we came upon a picture of a dog called Dinkie. A small, scruffy, Yorkshire terrier-type, this little portrait’s eyes shone. I was ten, and I was smitten. I vowed to own this dog in some way. It was beyond our means and our ken to purchase the painting. And possessing the dog was a possibility as distant as the Himilayas. And so, as soon as I got home, I fetched my sketch book and my pencils, and set about recreating this thing I wanted so very much. I didn’t do badly. I ended up with a small scruffy dog with shining eyes. It wasn’t a shadow of the beautiful little painting, but it was mine. I drew him everywhere, and with every drawing he became more completely possessed by me. Now here’s a strange co-incidence: Macaulay, the flea-bitten hound who dogs my waking hours and haunts my sleeping ones: he is identical to those little drawings of long ago. Yesterday, my friend Lydia and I went to the Hawk Sanctuary which is my family’s second home. These birds of prey are wild and unattainable, and never more evident was this than this day, when a wild wind played with their feathers and updraft whipped their focus away from the watching crowds to the skies above them. To watch the falcon weave and manoevre at up to 100 miles an hour – that was a privilege. But every time one catches ones breath at their beauty there is a need, if not to possess, then at least to capture this enchanting transience. Lydia has infinitely more patience than me. With a small camera she framed and took portrait after portrait, capturing the essence of each bird. I saw the pictures today, and marvelled that a simple shutter capture led to such beauty. We all have our ways of creating. Each one tries to distil something beautiful about life. From music and culture to running and engineering: each crystalises that act of achievement and creation. Even a diary is an attempt to stay the walk of time, to freeze-frame each day. Avarice and acquisitiveness: could it be that they are on the same scale as aspiration, just different polar ends? The base in us wants to have things and possess them , but the most elevated part of us aspires to express those things at which we wonder. Maybe we need to know we can’t have something, in order to let forth that well-spring of creativity. It makes me wonder: if all this affluence just went away, what would happen? William Blake’s writings and drawings are a revelation. They always have something new to tell me. Hundreds of years after he died, Blake puts a jewel of great price into my hand with his breathtaking thinking. He truly, for me, lives on. His ideas explode like fireworks in my mind. 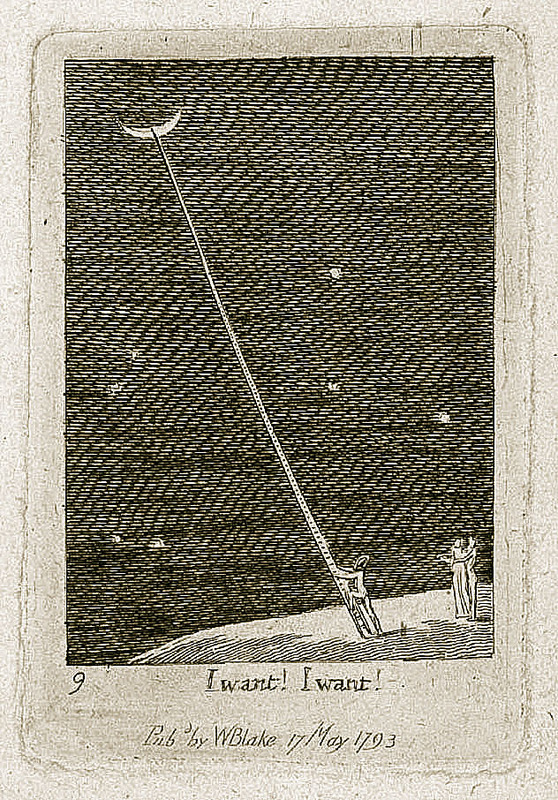 His picture for children: “I want, I want” comes from For Children: The Gates Of Paradise”, published in 1793. It has an eerie quality: it speaks differently to each of us. Have a look, and draw your own conclusion. Ah yes, the seduction of wanting… Spent a lot of my life there, but now, I find myself carefully evaluating choices, and the difference in wanting and needing, trying ever to simplify my life. We do come complete circle, don’t we? We certainly do, Susan. I wonder if, as the years pass, matters of the mind become more pressing and materials become just so much clutter. Just as you say: we are coming full circle. Another masterpiece Kate!!! It’s always a huge compliment to be included and if it wasn’t for you they wouldn’t have got taken at all! Ah, but they are marvellous. And they got a great FB reception didn’t they? Time for a big camera? My glass is now full! Thankyou……. You’re welcome, Jules. Couldn’t help thinking of your fishing when I wrote this….almost put it in…. Another great piece Kate, but ignoring the deeper and more intelligent message you are passing on to us all……when can I come to your neck of the woods and go shopping with Maddie at the Oracle?????? I’d dearly like to see a picture of your Macaulay, Kate. He’s at https://kateshrewsday.wordpress.com/2010/08/08/canine-politics/, Cindy:-). It’s rather an avaricious side of him, actually…. Mac is adorable! Sounds like a terrier through and through. They are fearless little guys. I have a Cairn “terror” MacDuff who thinks he is a giant. A VERY HAPPY, belated, BIRTHDAY to Maddie. Thanks Liz:-D I didn’t mention her birthday in the blog….there are some things a girl must have to herself….her self control yesterday put me to shame. i had forgotten the dog’s name was Dinkie, Kate. But I remember the exhibition at Beverley, and the instant fever you felt at that picture. What a memory. I loved the (very few) Dad/Daughter days we had together. Me too:-) And doesn’t Macaulay look the spit of him? What a wonderful post , Kate, and all credit to your daughter. Hope she thoroughly enjoys her selective treats! Cheers Naomi:-) I’ve been having a wonderful time vicariously resting along with your blog this week…. I expect that your “want” of Macauley . . . your detailed drawing of that desire . . . drew him too you. Aah . . . the power of attraction. Indeed! One sets a vision -was that Shakti Gawain who said it? – and one moves towards it.